So, it turns out that the slightly sceptical tone of my last piece about the potential for using Christian meditation/contemplation in schools was rather unjustified. An old friend (Rob) now in Australia pointed out that there have been well documented projects down under doing just that! There is more in this Guardian article. When an almost pathological “busyness” is the norm, valuing stillness and silence is counter-cultural. When our culture trains us to be winners, to compete and to consume, we all sense society’s imbalance, said Freeman. We need to give children an experience of another way of relating to themselves and to others. Deputy director Christie agreed. If children are over-stimulated we rob them of something precious: being allowed to “just be” where children discover their own inner sense of who they are. 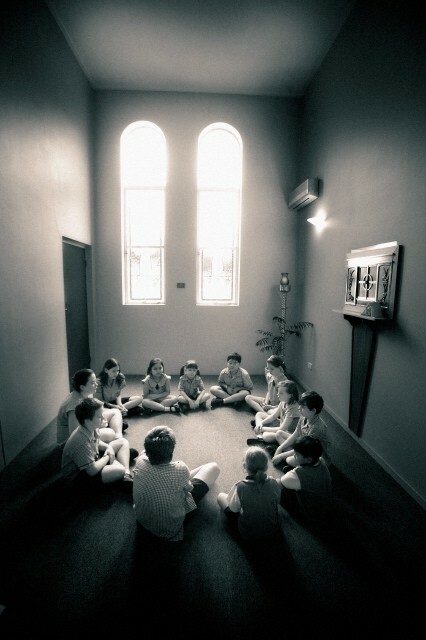 Hijacked by a “doing” culture that measures everything by what we achieve or possess, meditation helps children access a deeper part of themselves – an inner sanctuary away from a world of incessant activity and noise. They learn to honour their own spiritual life. The language used in this piece will be alien to some of us. We are used to all spirituality being mediated via head knowledge- treated as an opportunity to engage with Biblical knowledge or theological proposition. The idea of creating an ‘open’ space in meditation would have been regarded as deeply suspicious within the Christian tradition I grew out of. We would have suggested that this laid us open to some kind of ‘Demonic attack’. I have no doubt that this closed us off to traditions and practices that are sources of deep strength and blessing. What I like most about this piece is not just the possibilities for our children, but the greater possibility of us all becoming like children. A lot of the weblinks that relate to Lawrence Freeman appear to no longer work- links to resources and discussions about meditation with Children. I hope he has not fallen foul of the current conservative backlash in the Catholic Church, as I think he seems to me to be a source of light. There are a load of resources here however. He has been one of the founders of Meditatio. This entry was posted in meditation and tagged benedictine meditation, Catholic Church, Fr Lawrence Freeman, meditation, meditation in schools by Chris Goan. Bookmark the permalink. I heard a radio program about the use of silence within assemblies in schools in the UK., 5 minutes silence. Seems difficult to get your head around at first, but when you think about it, if you’re 40 or older, silence was mostly the norm in childhood, not much telly and selected radio in our house at any rate. Children are encouraged to scream and vent emotions, an then looked upon as ‘problem’ children if they do this in public and I am convinced that they struggle with the concept of self restraint when bombarded with the loud excitable tv, flashing lights and quickly moving images on DVDs and games. I am finding real difficulty in getting my 6 year old to cope with any period of no high stimulatory activity, to listen and to enjoy quiet, yet noise makes him act in a hyperactive manner. We now have what is called the ‘Ritalin generation’ here in the Western world. If we are not comfy with ourselves in silence I think children will have a really difficult time in the future, and this is showing in the lack of self esteem and growing violence among teens. I’m not blaming the lack of quiet meditation for all this but I think learning to reflect on what is within is important..it may have a valuable place in this society. I’m no medical expert but I have my own experiences to draw on in this. Best wishes, Nik.